New Horizons may be millions of miles beyond Pluto in the Kuiper Belt right now, but that hasn’t stopped the spacecraft from continuing to beam back glorious imagery of its encounter with our solar system’s weirdest little ice world. 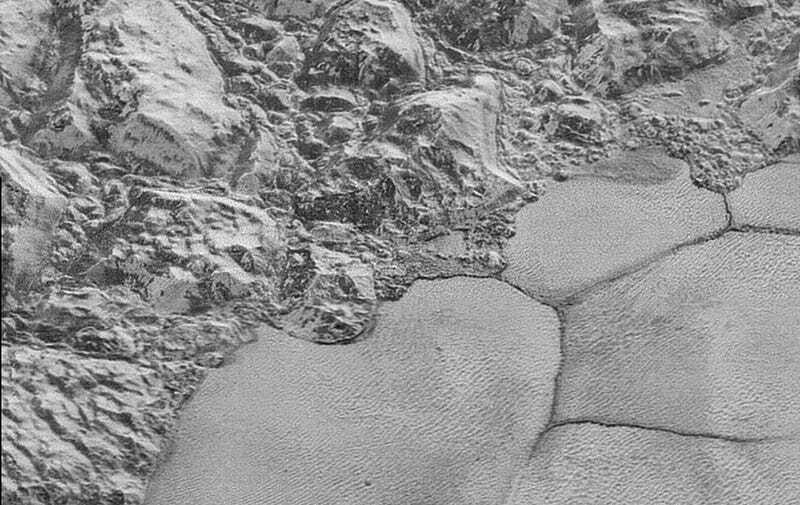 A new NASA video reveals the most detailed images of Pluto’s surface yet—and they’re spellbinding. The video below stitches together all of the highest-resolution images captured by New Horizons as it zipped past Pluto on July 14th, 2015. From a distance of 9,850 miles (15,850 kilometers), the spacecraft’s Long Range Reconnaissance Imager achieved a resolution of 260 feet (80 meters) per pixel across a 55 mile-wide strip of the dwarf planet’s encounter hemisphere. From cratered uplands to craggy badlands to blocky plains of nitrogen ice, Pluto’s rugged and diverse surface pops to life as if you’re cruising overhead in a helicopter. Unless somebody funds another trip to Pluto, these are the best images of the three billion mile-distant world we’re going to see in our lifetimes. But the story is far from over. As scientists continue to study the wealth of data collected by New Horizons, we can expect to reveal more of Pluto’s incredible secrets for years to come.